In this blog, the Law Society Professional Development Officer and second-year student, Megan McRobbie, reflects on the success of the 2018 Law Speed Networking Evening and on the important advice alumni can share with students at the start of their legal careers. 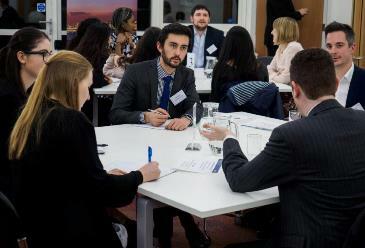 The Law Alumni Speed Networking Event has been held at the University of Surrey for the past four years. Following its popularity and my increased awareness of the importance of networking, I was keen to attend. There were various opportunities throughout the evening to network with the alumni in both a formal and informal style. The most beneficial was the main speed networking event where students were given 10-minute sessions to speak to each group of alumni. Those in attendance covered a broad range of career paths. There were barristers, professionals outside of law in business and government and solicitors who have gone on to careers in the city as well as in the local area. It was a fantastic opportunity to ask questions about the reality of each path and get an understanding of what led to each career choice. This was useful in reinforcing my personal ambitions and would certainly be helpful in informing students who were indecisive of the career they were looking to pursue after graduating. The alumni were extremely happy to answer questions and, during the informal networking time, showed real interest in the students by asking them questions and giving further advice about studying and topics outside of academia. Following the event, I spoke to my peers about their experience and they agreed that it was extremely helpful and a fantastic opportunity to network. The only criticism they had was that they wanted it to go on for longer to have more time with the alumni! I would like to thank all the alumni who volunteered their time – we are very grateful to them for making the event so successful. I would highly recommend that all law students attend this event in future, especially if students are unsure about their career goals or students looking to define their path. It was a unique opportunity to see the various options a law degree at Surrey can provide.